When I did my research as part of my Business Innovation Project at Salford Business School in 2014, I was not aware of the huge effect seasonality has in a brand or a business. While I was aware of the search trends and interests of the public, little I knew how much companies get affected by this matter. Two of the brands I analysed in my research are affected by seasonal trends in a different way, and so, we have had to develop different seasonal marketing campaigns. Let us drive you through a quick process to find out if your company, like ours, is more affected by seasonal trends than you had expected and figure out how what to do with these insights. UKTights.com – While one may think tights are a seasonal product, a quick Google Trends search shows that the search of the term “tights” is quite constant along the year, with autumn clearly being the busiest time of the year for demand and late spring the less popular time for searching tights. UKSwimwear.com – Swimwear is clearly more affected by seasonality. We may go indoor swimming all year round, but customers certainly tend to search (and, hence, buy) their swimwear in spring. Although still warm, August is actually the time of the year when the search for swimwear drops more significantly. The interest starts to gradually pick up in December to grow steadily until June, which is the peak time. Although the graphic below represents worldwide trends in 2017, data does not differ much when you look at previous years or the United Kingdom area, as shown in the graphic below. When you are able to predict when people are looking for your products or services, this allows you to focus all your marketing efforts ahead of that period of time. In the case of UK Tights, we have decided to maintain a constant marketing activity through the year, with more intensity in the coldest months of the year. As this is generally the time we have most of our new collections, it seems logical that we send more newsletters out and we intensify our Social Media activity. What about Christmas, Valentines and other seasonal campaigns? For some brands, seasonal campaigns are vital to balance their books. Creating landing pages for every seasonal campaign is time-consuming. Even more when your SEO team has to work hard to try to make them rank for the right terms. Our approach to seasonal marketing campaigns has reduced the number of specific landing pages for very festive seasons, ie: Halloween or Valentine’s day, and sale-related campaigns to a Sale section. On the left, an example of a Christmas campaign by UK Tights. Banners pointed to a landing page with a selection of gift ideas. On the right, UK Swimwear’s latest Cyber Monday campaign, which didn’t have a specifically-created seasonal landing page. For UK Swimwear, we have taken a similar approach, but we have involved the whole team in the process. As we know in advance when people are looking for swimwear, we can focus all our marketing activities towards raking No.1 in for the selected keywords by the time most people are going to be looking for swimwear. Planning in advance helps us decide when to spend our budget for advertising, as well as when to focus our Social Media and PR activity. For SEO, this means establishing a link-building strategy that allows you be found when people really need it. Or even better, to be found before your competitors can provide customers with the product or service you offer. Fashion trends in fashion can change abruptly from one to the next season, even more, when you sell luxury and exclusive styles as we do. Hence, having a collection available before the high-street stores and our online competitors is vital for our company. Due to the luxury nature of the products, UK Swimwear doesn’t focus its activity on customers who swim in their local swimming pool. Instead, the target audience is those women who like to wear something special they won’t find in the high street stores… or they won’t find in the person sat next to them by the pool when they are away on holiday. On the picture above, you can see a banner used to promote the collection Gottex Cruise SS18, which is UK Swimwear’s best-selling brand. This campaign was launched the first week of December 2017, right as the interest for swimwear grows. For entrepreneurs and SMEs, knowing when is your peak time means you can manage your budget more efficiently. Marketing a tool for analysing and monitoring the health of your company, but also for innovation. You can get to know better when you are going to need more staff, for instance. If you work on several projects, seasonal marketing will tell you when you can “relax” and focus on other activities, too. Seasonal Marketing planning should involve the all management areas, as well as the marketing team: buyers, sellers, Human Resources, etc. I hope this post makes you understand the importance of seasonal marketing planning. If you want to find out more about our latest campaigns or give us your thoughts about your post, follow UK Swimwear on Twitter or Facebook. We are always happy to exchange marketing ideas! During the Christmas break, I’ve been helping out Ivory Promise Brides in Bolton with their small business SEO strategy. Like a lot of small companies Ivory Promise have a WordPress website. 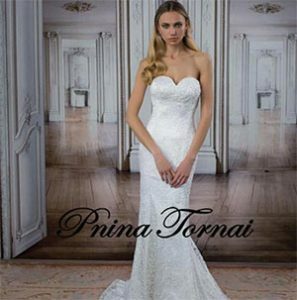 They are selling designer wedding dresses from the likes of Pnina Tornai, Eve of Milady, Naama & Anat, Blue by Enzoani, Mon Cheri and Charlotte Balbier. I hadn’t heard of these designers before – but they are really impressive and there’s clearly a market here for affordable luxury. The shop are also offering competitive prices and exclusivity to the UK or Europe, so there is a clear value proposition. They have even had enquiries from Dubai where people will fly across the world to their shop in Bolton to see their exclusive dresses. The first thing I did was try to define who the buyer persona is and then think about the appropriate channels, content and data in order to inform the digital marketing and SEO strategy. 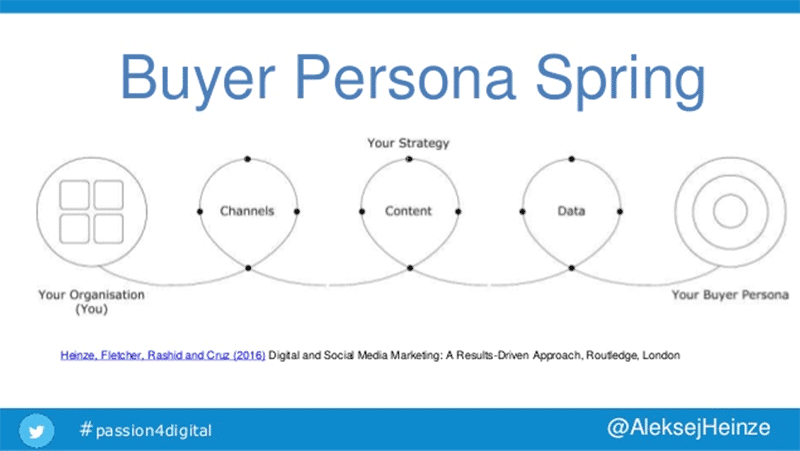 This is of course from our very own #Passion4Digital Buyer Persona Spring (shown below) from our book Digital and Social Media Marketing: A Results-Driven Approach. It’s ideal for Small business SEO strategy or indeed for larger companies! I logged in to their WordPress dashboard and then looked at the data they have from their social media channels, Google Analytics and Google Search Console to start snooping around for data and insights. What I found was that the site was driving a pretty reasonable amount of traffic, but not really generating many enquiries or conversions. The majority of users are female between the ages of 25-54 and generally from the UK. They were browsing the site usually on mobile (60%). I’ve also recently been reading the excellent book E-Commerce Website Optimization: Why 95% of Your Website Visitors Don’t Buy, and What You Can Do About it. Ivory Promise isn’t an ecommerce site in that, it doesn’t sell through the website, so the goal is to generate interest and enquiries. That said, there are a lot of useful insights in the book around user experience, copy optimisation and testing. Basically, the book advocates testing and subtle changes, which can make a big difference. Added a goal in Analytics for the contact page and derived keywords used, demographics, traffic etc. Pleased to say, soon after the changes were made, page views have doubled and the shop had a record day for enquiries through the website. Still much work to do – but I think this goes to show that some small changes can make a big difference. It is still a work in progress of course, but shows that you don’t need to spend a fortune, sometimes some small tweaks and attention can make a difference. Have you got any similar experiences or thoughts about small business SEO? We also run short face to face or distance courses in Search and Social Media Marketing. Please Drop me a line on any of this, I’d love to hear from you! X-debt is a debt company dealing mainly IVAs (Individual Voluntary Arrangements) a form of debt management and IVA debt advice . The company relies on introducers of new business which can be expensive. The aim of this SEO work is to try increase the amount of business through the company website www.x-debt.co.uk and improving the google rankings will help with this. Coming from a web design background, the course has offered me a great insight into the world of search and social media marketing and how I can adapt the skills within my business and for my clients. I would highly recommend the course and I hope this blog helps you decide whether this it’s right for you. Having some knowledge of SEO marketing you would think, “Why is he on this course?” but after 9 weeks I’ve learnt that there’s much more than a few input of keywords needed to improve your marketing on and off you’re website. The key areas I found most helpful to develop my marketing strategy are as followed. Student Accommodation in Cape Town and other South African cities is scarce. So, how does attending an Search and Social Media Marketing (SSMM) course in Salford lead to starting up a company to find student accommodation in Cape Town? And, more importantly, finding a solution to the student accommodation crisis in South Africa? What is the best way to use search and social media when starting an internet business? If TheRoomLink was conceived on the SSMM course, it was born on a late winter’s day in a cosy hotel bar in Ilkley. We’d had a few ideas for internet businesses based around the sharing economy. The idea we liked best was flexible renting. The idea was simple. Some people have spare space; they need income and other people need accommodation. It appears that according to Google, Social Media and small businesses is a combination that does not lead to ecommerce purchases in travel related business, and they are not even useful for promoting brand awareness! The web page that seems to suggest this is called “The Customer Journey to Online Purchase”. 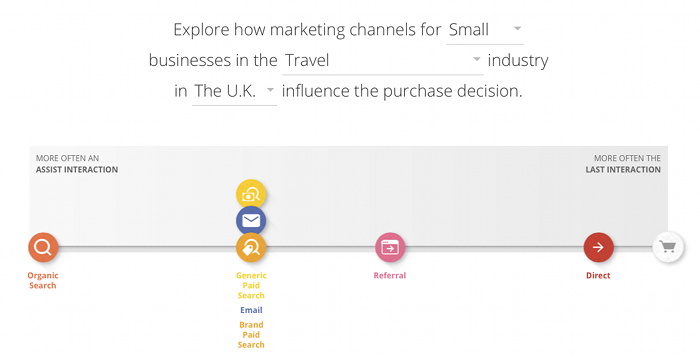 This page allows you to select a country, an industry and a business size it then displays a diagram which places icons representing various channels along a line leading to purchase online. It appears that the nearer an icon is to the right hand side then the more likely an interaction will result in a purchase, and entries nearer the left are good for getting your brand known about. We are all aware that social media plays a key role in marketing and business communications. Through growing up in a generation where everything was discussed online, whether it be homework, love interests or music, it was evident that online social networking had provided the general public with an opportunity to reinvent themselves entirely from behind a computer screen. The new quick and easy method of converting through an instant messenger, uploading photos and finding out information, without having to visit the local library, was revolutionary. Everything became easier. People could communicate with each other from anywhere in the world – and from this, millions of potential customers became accessible. In the field of events, this created a huge opportunity. The old marketing techniques of sending out press releases and contacting local media was no longer the key to boost your attendants. People were relying on social sites to gain feedback from others in order to consider attending an event. Therefore, once your target audience had been identified, all you had to do is go to the sites where they would typically visit for information – and promote. Social media had provided the public with a platform to create potential connections before, during and after an event had taken place. It had given potential attendants the opportunity to network, share topics and join discussions, giving the event organizer the chance to monitor these interests and create relevant content in order to involve their audience. Why did I choose to talk about events marketing? Because I had seen living proof of the importance of social media after I managed an event myself. Before I took the Search and Social Media Marketing Professional course, I had graduated from my Music Journalism degree at The University of Huddersfield this year. During my time studying, I had gained experience in various roles outside of university i.e. I had volunteered at an LGBT radio station and worked on a programme of my own, I had written countless music articles and reviews for websites and I had worked as a volunteer Press Officer for an independent record label for almost a year. Sitting in a cold, stone-walled office writing press releases in a leaky old building covered in graffiti near Great Ancoats once a week, dealing with stroppy musicians with no direction, and sorting out drunken old rockers who refuse to pay the entry fee on gig nights, I can honestly say – it was fun while it lasted. However, during my time working for the label, to mark their two year anniversary I managed and organized an event in the Huddersfield area with a fellow peer from university. During the marketing stage of the event, I managed the Facebook and Twitter accounts to give potential attendants the opportunity to invite others and network with each other, while I would continuously post content and updates relevant to the event. Through this, we were acknowledged by students who blogged about it, and published it in the student newspaper. Then word reached the Huddersfield Examiner who wrote an article about the event. During this time, we also had the musicians and record label promoting the event through other websites and social platforms; therefore, through all of the promotion we generated online, we managed to fill the venue to the brim with attendants. Although the venue was facing the university and fairly popular, the staff informed us that they had never seen it so busy in their time of being open. In the end, it had worked wonders for our sales and we had made a fantastic profit – accomplished entirely through the use of social media and online marketing. I began working for Salford Professional Development as a Marketing Officer in August. Since I began working for SPD, I focused my attention to the social media platforms immediately and brought up the Likes, Connections and Followers noticeably in a short period of time. I was also managing the social media for the Salford Media Festival, and through continuously posting and tweeting updates and news, we were generating more interest, supporters and even some ticket sales through Twitter and LinkedIn. I took advice from a social media expert and ran a campaign to give away two free tickets to the festival in exchange for Follows and Retweets on Twitter, in just two weeks we gained up to 200 more Followers and, as predicted, people were Retweeting like no tomorrow. An important rule in marketing – people love free stuff! In conjunction with this, we paid for a temporary Facebook advert, which almost doubled our current Likes in just 3 weeks of being live – this gave us a good head start to build Likes. Through continuously posting news and updates on social media, we began to see the traffic coming through to our websites on Google Analytics. Approximately 6% of our click rate traffic for the Salford Media Festival website was referred from social media, namely Facebook and LinkedIn. It doesn’t seem much, but it makes a visible difference. Interestingly, although the most visible activity and interaction we receive is through Twitter, there wasn’t any noticeable traffic coming from this platform, as followers preferred to Retweet, rather than explore links. I would advise to keep Twitter for interacting with your audience in simple ways – by using Retweets and hashtags – as Twitter users like to keep things straightforward, but ensure your content on Facebook and LinkedIn is appealing and engaging enough to generate clicks to your website links. In Events Marketing, it is vital to share, post and tweet continuously and consistently. Generating excitement and anticipation towards the lead up to an event is important. Link building and contacting relevant websites to help with the promotion is also a good way of branching out and reaching a wider audience, as it generates more interest and response. We offered various media-based websites discount codes off ticket prices to promote to their members for Salford Media Festival, which proved successful for our revenue. I chose to attend the Search and Social Media Professional course so that I could develop in the area of online marketing and social media enough for the company to see a real difference from the marketing generated by myself. I didn’t have experience in Search Engine Optimization, therefore the SSMM course seemed like the perfect opportunity to progress and put some new skills into practice. I took the course simply because, although I entered my teenage years during the explosion of online interaction, SEO and social media marketing are completely different notions. They involve technical strategies and consumer awareness, rather than just socializing and sharing. In order to reach business success, there’s more that needs to be considered when marketing in the virtual world. Overall, the course has taught me how to build links effectively, how to engage your audience through social media content and create effective campaigns, how to make use of keywords, how to use Webmaster Tools to keep up to date on your click through rates and what interests your audience, and to make use of all social media platforms to create brand awareness. I intend to integrate all of these tactics into my work. In today’s digital world of sharing and networking, marketing your services online can take The Water-Cooler Effect [or Word of Mouth Marketing], to a powerful new level. Campaigns can go viral overnight. The key is to think outside the box, identify with your audience and research their needs, and never underestimate human emotion. The recent Christmas ad campaigns by John Lewis and Sainsburys will tell you that. I already have many plans and ideas for SPD, through taking the course, in order to create brand awareness and generate more sales, and I hope to continue my progression in the field of Online Marketing, using the experience and knowledge I have gained –hopefully accomplishing some noticeable results. Search Engine Optimisation (SEO) and Social Media Optimisation (SMO) are no longer an optional choice for many organisations competing for the increasingly internet savvy consumers. Do you have a digital strategy and a social media policy? Do you know that if you don’t manage your social media presence chances are your customers will manage it for you and not always in a most favourable way. As part of the University of Salford’s commitment to delivering the best digital training available, Salford Professional Development have developed a one day ‘SEO & Social Media Marketing Essentials‘ course. This course is aimed at busy executives who want to have theoretic understanding as well as some basic hands on practical exercises which will highlight the essentials in SEO and Social Media Marketing. This knowledge will enable you to develop a better understanding of your customers behaviour online and help you to develop long term plan and implement basic techniques for management of day to day social media engagement. Working from your business objectives you will be able to draft some key performance indicators for your online presence, identify key social networks for your organisational use as well as conduct some basic Social Media Optimisation. The main focus on this course is to offer you a broad overview of search and social media marketing and help you to start working on your long term digital marketing strategy as well as plan for use of techniques. The course will be taught by Dr Aleksej Heinze, Aleksej is a co-director for the Centre for Digital Business which is part of The University of Salford’s Business School. He currently works on an international projects Passport to Trade 2.0 which helps businesses to understand International Business Culture and develop new business opportunities in Europe using social media networks. The course will also feature Martin Cozens who is the Managing Director for Banc Media. Based in Old Trafford, Manchester, Banc Media are a Search Engine Marketing company providing Pay Per Click & Search Engine Optimisation. They specialise in a measured & transparent approach, focussing on ROI for our clients through researched search engine marketing. Breens Solicitors – a renowned law firm operating out of Merseyside for both private and business clients. SEO & Social Media Marketing Essentials is based and delivered at the state of the art teaching and training facilities in the heart of the UK’s Media hub at MediaCityUK, University of Salford. This cutting edge facility is on close proximity of the BBC, ITV and many other top digital and media agencies. This course costs £299 + VAT. If you wish to enquire about this course, simply get in touch with Robert Goodison at Salford Professional Development on 0161 295 5407 or email R.Goodison@salford.ac.uk. This course is aimed at busy executives who want to have theoretic understanding as well as some basic hands on practical exercises which will highlight the essentials in SEO and Social Media Marketing. This knowledge will enable you to develop a better understanding of your customers behaviour online and help you to develop long term plan and implement basic techniques for management of day to day social media engagement. Working from your business objectives you will be able to draft some key performance indicators for your online presence, identify key social networks for your organisational use as well as conduct some basic Social Media Optimisation. The main focus on this course is to offer you a broad overview of search and social media marketing and help you to start working on your long term digital marketing strategy as well as plan for use of techniques. In collaboration with Fast Web Media Limited (FWM), Salford Business School has been awarded a Knowledge Transfer Partnership. The project’s aim is to develop and implement a Dynamic Campaign Management Tool (DCMT) for integrated media and digital marketing campaign management. Primarily based at the company premises in Media City Salford, the successful applicant will manage the project supported by the experienced staff from both Fast Web Media Ltd and the University of Salford. FWM is an award-winning digital marketing agency turning over £2 million per annum. They are involved in the design and development of digital marketing services, specialising in search marketing, search engine optimisation, technical development, social media and mobile. The UK’s digital advertising market is currently worth over £4bn (25% of the total UK advertising spend) FWM has identified a need for a Dynamic Campaign Management Tool (DCMT) that would allow precise monitoring, tracking and management of campaigns across the full spectrum of digital media properties. The industry faces a number of specific problems – a consequence of its relative immaturity. For example, the ability to quantify the effectiveness of different types of digital advertising. The KTP will develop an integrated online system with a holistic Dashboard interface enabling a summative view of an entire campaign across multiple channels and the capability to adjust campaigns in real time to respond to live events thus influencing buyer behaviour. E.g. a campaign which uses Google TV channel initiates a lot of twitter activity about a product, the tool will allow a company to monitor and engage in this interaction; thus adverts can be strategically positioned on the particular social media channel such as Twitter (minimising pay-per-click time) for a critical period to capitalise on public interest. The DCMT will offer specific benefits to campaign management and decision-making. Sophisticated tracking and access to live trends will enable more precise calculation of Return on Investment (ROI). FWM will lead and contribute to the reputation of the digital marketing industry by developing a transparent solution which will offer unparalleled access to information and offer opportunities to interact with campaigns; be able to predict the performance of campaigns. – Ability to undertake multiple tasks, work under own initiative and/or as part of a team, and lead a team.